Perhaps no other Union commander’s reputation has been the subject of as much controversy as George B. McClellan’s. Thomas J. Rowland presents a framework in which early Civil War command can be viewed without direct comparison to that of the final two years. Such comparisons, in his opinion, are both unfair and contextually inaccurate. Only by understanding how very different was the context and nature of the war facing McClellan, as opposed to Grant and Sherman, can one discard the traditional “good general-bad general” approach to command performance. 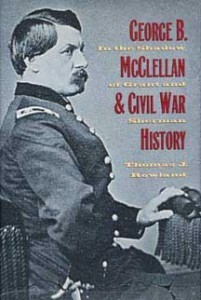 In such a light, McClellan’s career, both his shortcomings and accomplishments, can be viewed with clearer perspective. AuthorThomas J. Rowland is an instructor of history at the University of Wisconsin, Oshkosh. His articles have appeared in Civil War History, Catholic Historical Review, Eire-Ireland, and Journal of American Ethnic History.